Rechargeable with dual-fuel compatibility. Quick-release bike mount. Neutral white light with dual distance beam. COB with red LED chips creates a broad output. Adjustable mounting angle for perfect placement. According to www.bikelaw.com, which focuses on Oregon bicycle laws, it is required that you to be equipped with at least one light if you are riding during "limited visibility conditions." Bike lights for night riding can be separated into two different types: seeing lights and be seen lights. A seeing light is one that illuminates the area in front of you, the cyclist. For best visibility, we recommend keeping your bicycle headlight between 700 and 1000 lumens when riding unlit roads, and between 100 and 300 for lit roads; however, if you are a speedster, you might prefer one with a slightly brighter output. The best bike lights for night riding also must meet the requirement of being visible from 500 feet away. The placement of your bike light is also incredibly important to its overall effectiveness. The ultimate setup would include both a handlebar-mounted headlight and a helmet-mounted light. The handlebar headlight illuminates the area directly in front of you and can reveal upcoming obstacles, such as rocks or potholes. 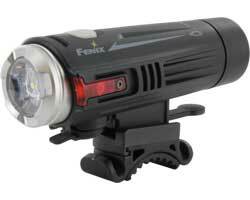 We recommend the Fenix ALB-10 quick-release bike mount for securely attaching your light to your handlebar. The helmet-mounted bike light, on the other hand, is more-so geared towards viewing specific areas, such as down the cross street of an intersection or in the rustling bushes beside you. Please note that your helmet-mounted light should offer a more focused, spot with a far-throwing beam to view off into the distance. Be seen lights are designed to mark a rider on the road so that motorists can easily spot a cyclist. As previously mentioned, if you are only riding on illuminated roads, a headlight between 100 and 300 lumens is sufficient. 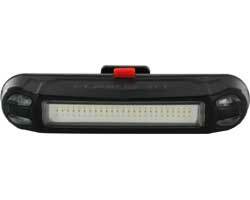 Be seen lights also include front, side, and rear lighting tools to help motorists see you from all angles. While all modern bicycles require the incorporation of passive, non-powered reflective lighting tools, adding a tail light and spoke lights will only help to increase your safety. BatteryJunction.com offers an assortment of be seen lights, including the SpokeLit wheel light that is available in a few color options. This spoke bike light easily attaches to the spoke of your bicycle without any additional hardware or tools. When choosing the best bike light for your needs, it's important to consider more than just your own ability to see the road. For road riders, in particular, having a headlight that is too bright could potentially be hazardous to drivers and other riders. To combat this, the German Road Traffic Licensing Regulations (StVZO) developed a set of guidelines for nighttime riders. Like the Oregon bicycle laws mentioned earlier, cyclists are required to have passive rear and spoke reflectors. Additionally, the StVZO requires both a front-facing white light and a rear-facing red light, such as the Nite Ize Radiant 50. Those lights should have steady-on outputs and should not blink or flash as is typical in many bike lights. More importantly, the StVZO has set a minimum brightness level as well as horizontal cutoff points for a user's beam pattern. In other words, the beam must be set above and below a certain height to prevent it from disorienting drivers. For best results, we suggest consulting your local authorities to make sure your bike lights meet the local requirements and restrictions.